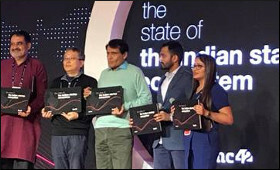 Indian startups have the capacity to bring about transformational change to India’s growth story, said Union Minister of Commerce & Industry Suresh Prabhu, in New Delhi on Friday. Speaking at the launch of a report on the State of the Indian StartupEcosystem-2018 by Inc 42, Prabhu said that the Commerce & Industry Ministry is taking many initiatives to foster a positive and empowering ecosystem for startups togrow and flourish in the country. To this end many regulations which were in place for traditional industries are now being reviewed and either scrapped or modified in order to facilitate the ecosystem which will fosterand encourage startups to take root in India, he added. Prabhu said that the Ministry is holding a global investors meeting next month in India where top investors are being invited to participate in a roundtable meeting in order to pave the way for greater investments in Indian startups. He referred to the jump that India has made in the Ease of Doing Business rankings and said that all efforts are now being made to ensure that India joins the group of countries in the top 50. In his address, Prabhu said that change is the new constant in today’s world and the youth of India have within them the grit and determination to create positive change through new ideas which will benefit citizens of not only India but bring about positive change globally.